LoadLifter 5000 kits are Air Lift's heaviest-rated air spring kits, specifically engineered for hauling or towing heavy loads. LoadLifter 5000 air springs are designed to fit popular vehicles like 3/4 ton and one-ton pickup trucks, motor homes and commercial trucks. LoadLifter 5000 air springs provide up to 5,000 lbs of leveling capacity* - never exceed manufacturer's recommended gross vehicle weight rating. Air lift air springs work with your existing suspension to give you more leveling support when you need it, so your vehicle is always level and stable. Proper weight distribution to all tires means more safety and a more comfortable ride as well. This results in: Improved braking and steering, less sway, less bottoming out, headlight aim, less porpoising and even tire wear. Air lift LoadLifter5000 kits can easily inflated/deflated on-the-go. For convenient air spring control at the touch of a button add a Air lift on-board compressor system. See "Vehicle" tab above for the complete list of vehicles this product is designed to fit. Air Lift Company is a manufacturer of air suspension kits (also called air bag suspension) providing the ultimate air ride for towing and hauling with safety and comfort. 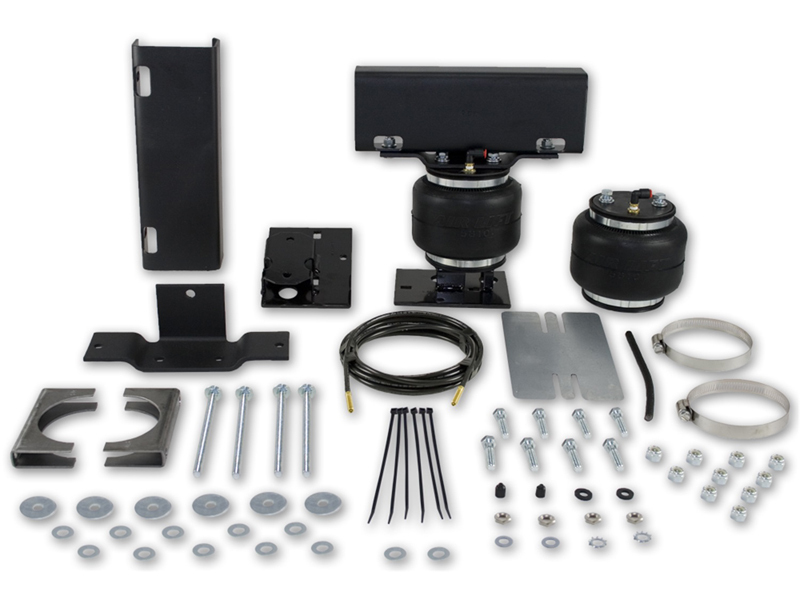 Air spring kits provide increased support while towing or hauling heavy loads. Our air bag suspension kits work with existing leaf or coil suspension systems to provide a safe, stable and comfortable air ride. Air Lift's air suspension kits include everything needed to fully and easily install, including the air springs, brackets, fittings and air line. Add an Air Lift on-board air compressor system to inflate and deflate your air helper springs with the touch of a button from inside or outside of the vehicle. Only Air Lift's Lifetime Warranty covers the entire contents of the kit, not just the air springs (also called air bags). We also offer an industry-exclusive 60 day No Questions Asked Money Back Guarantee on our air helper spring kits and compressor systems.